Regenerative medicine offers physicians new tools to help repair damaged tissue, alleviate pain, accelerate healing, and improve function for patients with degenerative conditions or sports injuries. 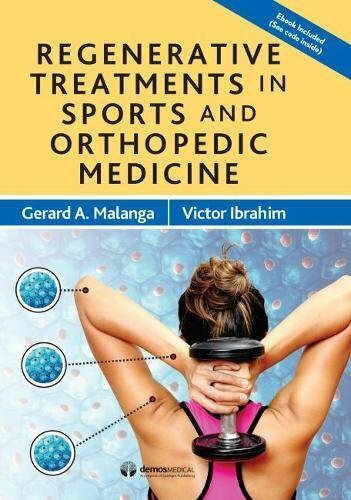 Regenerative Treatments in Sports and Orthopedic Medicine is the first comprehensive book devoted to orthobiologic treatments for orthopedic conditions. Authored by experts in regenerative medicine, this evidence- and experience-based guide is written for clinicians looking to understand and effectively implement these treatments in their practices. Broad yet focused coverage of the scientific underpinnings, regulatory issues, staffing and equipment, nutritional and rehabilitation concerns, and orthobiologic interventions for specific clinical problems make this the ideal procedural reference for anyone working to restore function to athletes or other patients with musculoskeletal pathologies. This entry was posted in stem cell book and tagged Medicine, Orthopedic, Regenerative, Sports, TREATMENTS. Bookmark the permalink.